To get prepared for Stop on Red Week, let’s have a refresher on traffic signals. As our Pennsylvania Driver's Manual states, Traffic signals are installed at intersections to control the movement of vehicles and pedestrians. Traffic signals are arranged in either vertical lines or horizontal lines. When they are arranged vertically, red is always on top and green on the bottom. When they are arranged horizontally, red is always on the left and green on the right. When there is a STEADY RED LIGHT, you must stop before crossing the marked stop line or crosswalk. If you do not see any lines, stop before entering the intersection. Wait for a green light before you start. You may turn right while the light is red, unless a NO TURN ON RED sign is posted at the intersection. You must first stop, check for and yield to pedestrians and other traffic. You may also turn left after you stop at a red light, if you are in the left lane and are turning left from a one-way street onto another one-way street, unless a sign tells you not to turn. You must first stop and yield to pedestrians and other traffic. A STEADY YELLOW LIGHT tells you a steady red light will soon appear. If you are driving toward an intersection and a yellow light appears, slow down and prepare to stop. If you are within the intersection or cannot stop safely before entering the intersection, continue through carefully. A STEADY GREEN LIGHT means you may drive through the intersection, if the road is clear. You may also turn right or left unless a sign tells you not to; however, when turning, you must yield to other vehicles and pedestrians within the intersection. Red-light running is an aggressive driving behavior. Speeding and other aggressive driving behaviors are among the leading causes of highway crashes and fatalities in Pennsylvania. However, many motorists don’t realize they are in aggressive drivers. Did you know that in 2016 alone there were 1,088 crashes? To view crash data from Pennsylvania visit the Pennsylvania Crash Information Tool (PCIT), the public gateway to the Commonwealth’s crash statistics. Crash data involving drivers, passengers, and motor vehicles allows PennDOT to identify highway safety focus areas. Remember that stopping on red is not only the law, it protects your life and others. Show your support to keep our roads safe by pledging to always stop on red on the National Coalition for Safer Roads (NCSR) website. 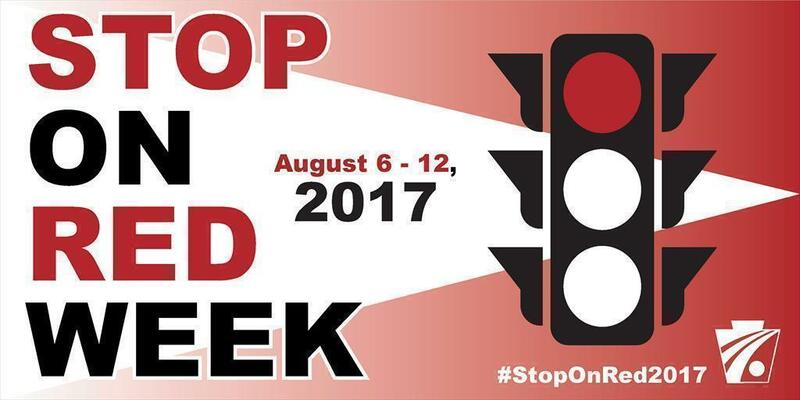 Join the conversation on social media, using the hashtag #StopOnRed2017.